Carved Bone Sea Glass Hair Stick made in Alaska by Artisans. It is a known fact that Hair Sticks never go out of style. 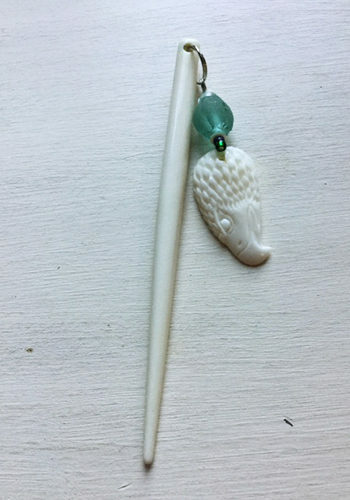 This elegant Carved Bone Sea Glass Hair Stick will be turning heads everywhere you go. 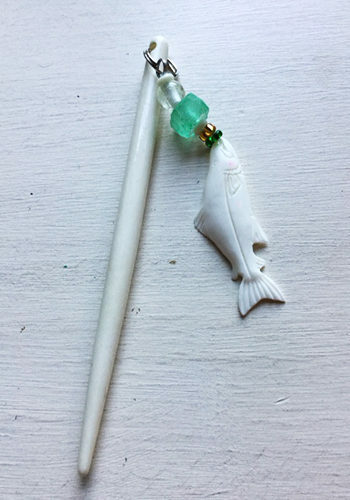 This colorful Sea Glass Hair Stick is carved from bone. Honestly the Sea Glass is a symbol of Alaska’s frontier. 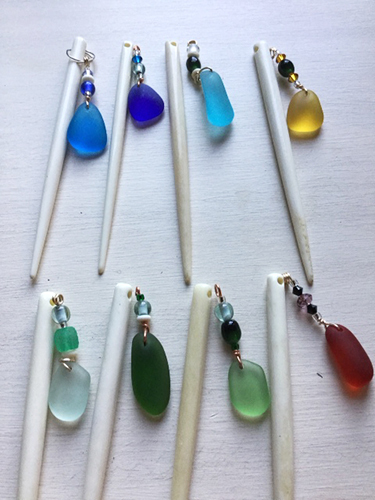 In addition these hair sticks are made from a shaft of real bone and adorned with beautiful colorful Sea Glass.You can choose from one of these wonderful colors sky blue, royal blue, aqua, gold, sea foam green, forest green, kelly green, and red. 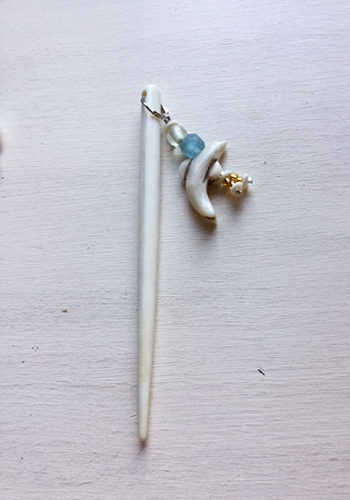 Moreover this Carved Bone Sea Glass Hair Stick will make a truly unique gift for some lucky lady. In all honesty you will find that each of these beautiful Hair Sticks are different and unique. 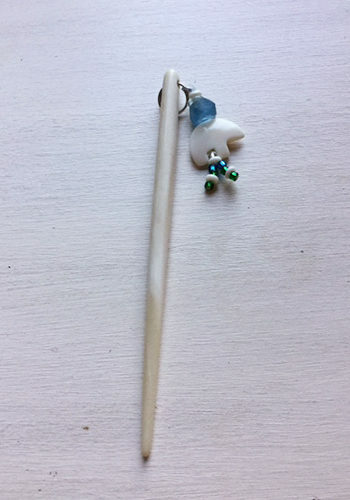 First on the list is this rustic Carved Bone Sea Glass Hair Stick with Sea Glass Charm. Sea Glass is a colorful beautiful one of a kind jewel sought after by collectors. These Hair Sticks brought to life in this rustic hand carved bone fetish. Each bone fetish is hand carved and unique making each piece of jewelry unique. 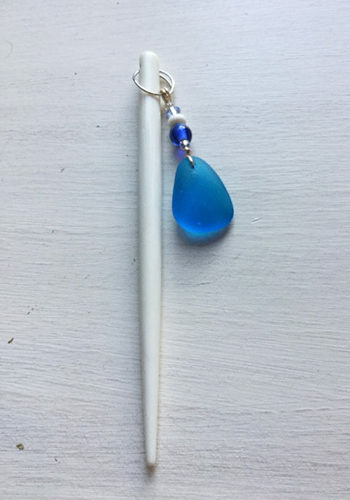 Furthermore this lovely Hair Stick is adorned with beautiful Sea Glass. Besides that, each Hair Stick has a beads made from decorative glass. Sea Glass is tumbled along the floor of some great body of water for decades until it forms a beautiful jewel of color. Each piece of Sea Glass is rolled back and forth for decades until it forms into a sparkling gems of color. Finally the Sea Glass beads are accompanied by colorful decorative glass bead accents. All of these elements come together to form this wonderful work of art. Honestly these lovely Hair Sticks will surely be the jewel of your collection. I am sure you will want to collect them all.